The classics are always a good source of inspiration. Starbyte has turned to one of the more memorable classics for Space Invasion, an homage to the classic 70’s coin-op game Space Invaders. Last Man Standing: Things are looking pretty bleak as this laser cannon tries to blast the last stragglers of this wave of space invaders—er, invasioners. Space Invaders, which I spent plenty of money on as a kid, was a simple black-and-white game (with some green and orange cellophane taped on the display for color) in which you manned a laser cannon as you defended the Earth from a never-ending invasion of squid, octopus and crab-looking invaders that fire down on you as they get closer and closer to the ground. You hid beneath crumbling defenses as you moved your laser cannon to the left and right, firing on the waves of aliens. Space Invasion cuts pretty close to the bone of the original—similar graphics and sound effects are used here, though the design of the alien “waves” has been modified and changes from level to level. You even have the occasionally passing UFO up top, which will rain fiery death down upon you and reward you with extra points if you time your shots well enough to hit it. Another enhancement is the use of powerups—occasionally, the bad guys will drop goodies that you can intercept (to add a life, for example). Likewise, occasionally the bad guys will also drop big guided bombs that you have to avoid, lest you be destroyed. Space Invasion also adds support for two players. If you want to play with a friend, you can simply hand off your iPhone or iPod touch in between each life, and compete for a high score. 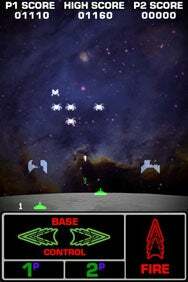 Space Invasion maintains the vertical orientation of the original game, so you play holding your iPod touch or iPhone upright, moving your laser cannon to the left or right and firing via on-screen buttons. This works out okay for the most part, but I found myself occasionally slipping up and hitting the right button when I should have hit left; I think a “dead zone” between the two directions would be helpful. Space Invasion’s developers might want to take a page from touchGrove’s playbook for LED Football, and price this at $1—cheap enough to be an impulse buy for anyone of a certain age who wants to relive their misspent youth. Space Invasion is compatible with any iPhone or iPod touch running the iPhone 2.0 software update.